Winterizing a mobile home means more than just caulking around doors and windows and adding insulation. Most of us already know to do that. The following tips will help you winterize your mobile home like a professional. These lesser-known energy-conservation tips have been tested by the National Renewable Energy Laboratory or NREL, in a partnership with the Department of Energy. They tested 7 different mobile homes and determined which winterization, energy conservation, and air sealing projects worked best. Return air plenums, especially in the 1970s and 1980s model homes that have large return air-ducts in the floor or ceiling. You’ll need to hire an HVAC professional for this but if your home has this kind of setup it will be a good investment. It’s recommended that these openings be sealed off and return registers furthest from the furnace be rerouted using flex duct. If you your furnace closet has a main return-air opening in the floor or ceiling that should be closed off as well and new openings created in the door or side walls of the closet so the furnace blower pulls its return air from within the home. HUD requires at least 2 square inches of return air area for every 1000 Btuh of furnace capacity. Be sure to hire a professional to do this. 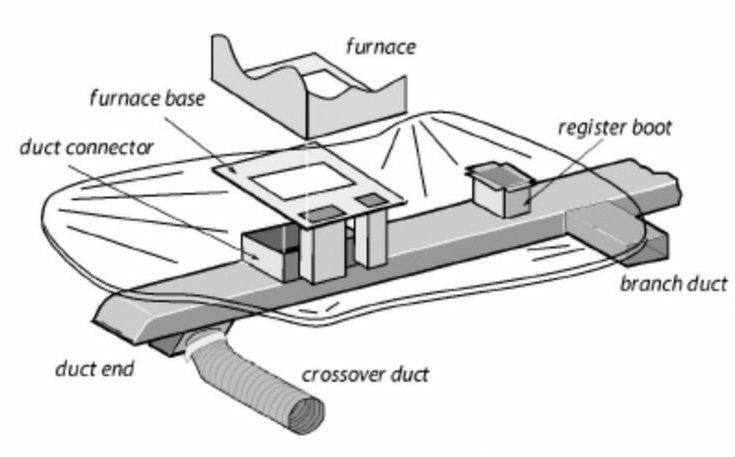 Sealing the furnace base and duct connector, or boot, can reduce air leak and save money on utility bills. Forced-air supply ducts have high air leak potential. The ducts are usually in the floor but Southern homes may have them in the ceiling. These ducts or tunnels and the boots that connect the ducts to the home can allow a lot of cold air into your home if they aren’t regularly sealed. To seal the ducts and boots, you can use silicone caulking for smaller holes but you’ll need aluminum-foil butyl tape or mesh tape to seal the corners, joints, and cover larger holes. You’ll then apply a thick layer of mastic. For especially large holes you’ll need to fasten a sheet metal patch over it and then seal the edges with tape and mastic. Be sure to apply mastic over butyl tape to make it last. You don’t have to crawl under the home to do this. While sealing your ducts from below the home is always the better choice you can do a little duct sealing and winterization from inside your home. You can read our guide to sealing mobile home ducts here. 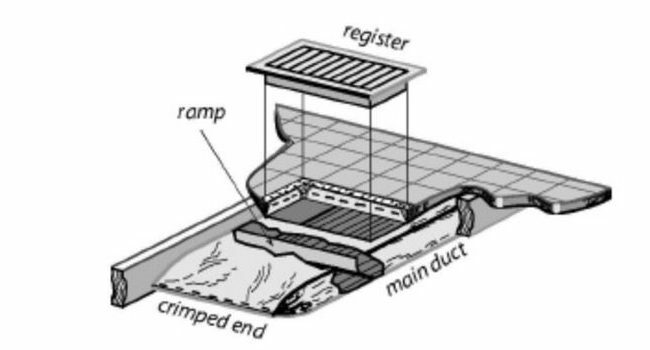 The registers are usually just crimped to the main duct. Sealing this area with mastic or tape can help reduce air leaks. Plumbing in a mobile home is different from a site-built home in one major way – the pipes rise up through the floor instead of through walls. This creates a lot of cracks and crevices that allow cold air to enter the home. To truly winterize your mobile home you will need to seal around all supply and drain pipes. Pay special attention to seal around your washing machine supply and drain lines, under all your sinks, and even under your bathtub if possible. Your water heater chimney will be another location to inspect and sealed if needed. HUD began requiring exhaust fans in manufactured home kitchens and baths years ago. Because they are out of sight a lot of homeowners don’t think about them when they winterize their homes. This is a mistake. You’ll need to caulk around the exhaust fan and its register around your ceiling so that the cold air doesn’t reach the interior of your home. The marriage line on a double wide has a rubber seal that helps seal the two sides together to form an airtight membrane. 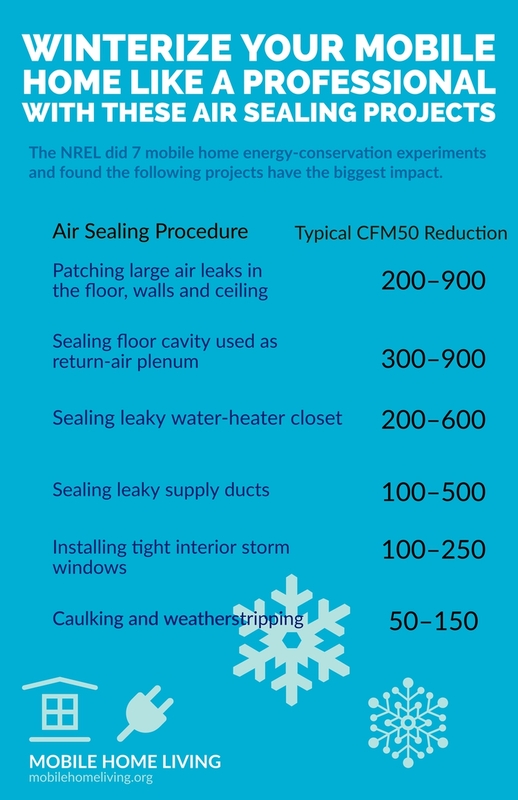 However, these seals can’t work properly if the home has become unlevel. Sealing and adding insulation around the marriage line is never a bad idea. A lot of articles about winterizing your mobile home forget to mention that your light receptacles and light fixtures are well-known to leak air. Mobile homes are built and insulated in a way that creates air gaps between your interior walls and siding and ceiling and roof. Any hole in your walls or ceilings will allow that air to flow so it needs to be sealed. You can use caulk for smaller cracks but if it’s a large crack you may need to create a frame to rest between the receptacle and the wall or ceiling. New insulation should be added between the joists and then the belly wrap needs to be patched or replaced quickly. 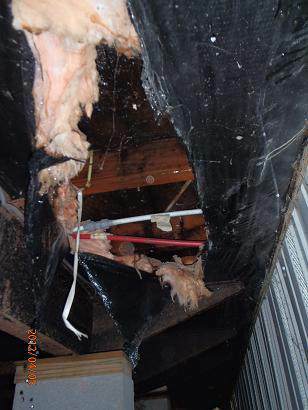 The underbelly is the sheeting attached to the underside of your mobile home. 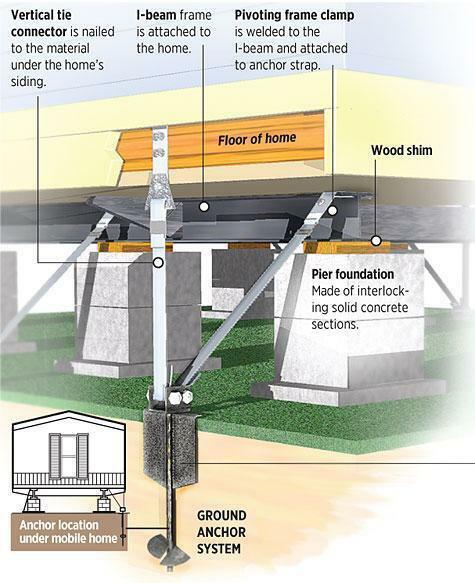 Older mobile homes have underbellies made from heavy tar paper or asphalt-impregnated fiberglass cloth but new homes use fiber-reinforced polyethylene. If the underbelly is missing or damaged you absolutely need to get it repaired. This isn’t just about winterizing your mobile home, underbellies also help deter rodents and critters and aids in keeping ground moisture from rising into your home. If your underbelly is missing, chances are your insulation or insulating blanket will be as well. Take a day to create an airtight underbelly. To do this you need to do 3 things while under home: seal and caulk your ductwork, add insulation between the floor joists of your home and attach a new underbelly. If you can, go ahead and add a new ground vapor barrier while you’re under there. You’ll surely lower your heating and cooling costs and create a more comfortable and longer lasting home. The following tips are more common in articles about winterizing mobile homes. They are so important we wanted to go ahead and add them along with the lesser known winterization tips. Most experts recommend that you loosen your mobile home’s tie downs a couple of inches before winter to allow the home to shift if the ground should freeze. Frozen ground can shift 2-3 inches and that can cause strain on your tie downs and, in turn, on your chassis and joists. There are some easy ways to weatherproof your mobile home heating system. If you have a maintenance agreement with your heating installer, give them a call and schedule a maintenance appointment before the weather turns cold. Although messy, cleaning your gutters are a necessity to winterize your mobile home. If not clear of leaves and twigs it won’t drain. Once it gets below freezing you will have ice in the gutters which will hold snow and ice up against your roof’s seam, a sensitive area to begin with. 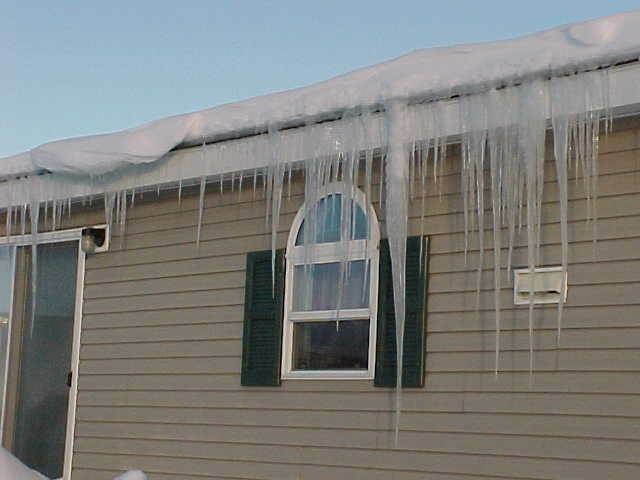 Ice is heavy and can cause your gutters to pull away and fall, damaging siding, and windows in the process. Simply remove the leaves and debris from the gutter and spray it out with a water hose until the water flows freely out of the downspout. You’ll want to keep a check on the gutters throughout the winter months. We’ve covered all the basics of blowing insulation into your home’s walls, floors, and ceiling cavities here. If your home has a lot of cold spots and you just can’t seem to stay warm it’s probably time to for new insulation. You can do it yourself but it’s probably less stressful if you can hire it out. Click here to read our complete mobile home insulation guide. 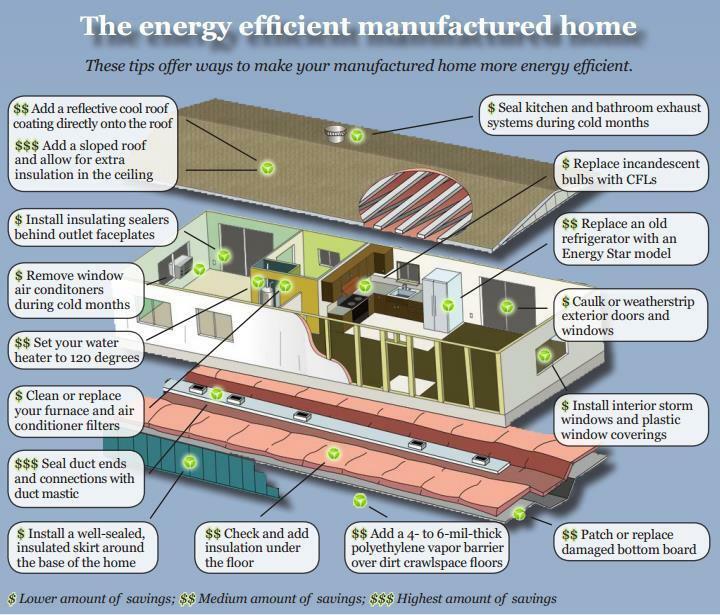 More energy savings ideas for your mobile home. Winterizing your mobile home to minimize air leakage will absolutely save you money in the long run. Every home needs a little attention as it ages but older and more affordable mobile home models need some additional attention. These tips will help you understand where your attention is needed most and how to get the best return on your investment. Hopefully, these five tips to help weatherproof your mobile home will help you save on your heating bills this winter and keep you and your family warm and toasty this season. Glad you liked it, Debra. Every little bit of improvement and maintenance helps!